A promising new chapter is ahead for Southern Nevadans who, for the first time in their lives, have stable housing and the keys to their own apartments. The first keys were presented to former foster children during a ceremony June 1 at Olive Crest’s Project Independence facility. The presentation featured housewarming gifts, living room and bedroom furniture donations from Best Mattress, tours of the new residents’ living quarters and remarks from Olive Crest and Bank of America executives. 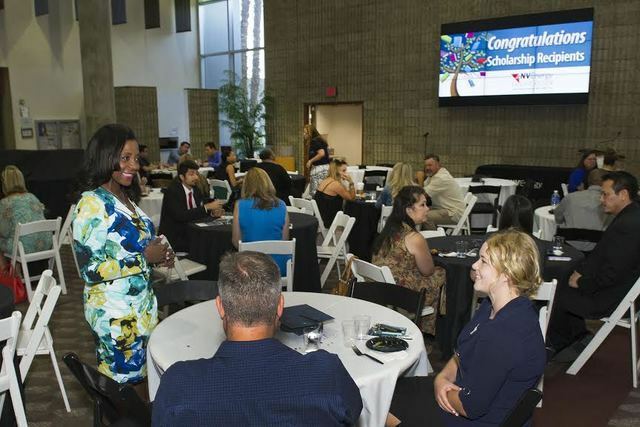 NV Energy awarded 90 Powerful Partnership scholarships of $1,000 each and two NV Energy Dependent Scholarships of $2,000 each to Southern Nevada high school seniors who have demonstrated leadership in both academics and community service. This is the highest number of scholarships the company has awarded in a single-year since starting the scholarship program in 2000. The new facility is made possible by Bank of America’s $200,000 Neighborhood Builders award, which Olive Crest received in December. 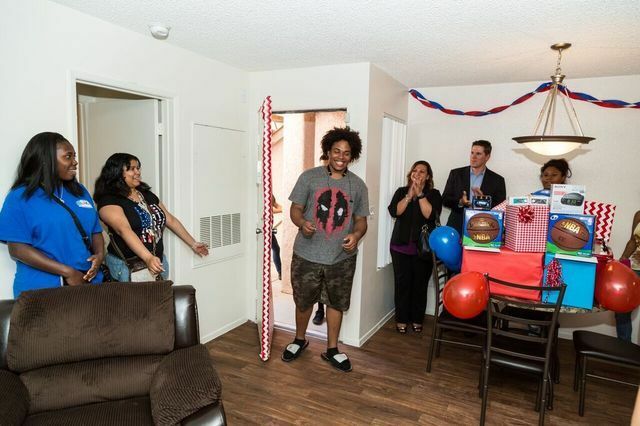 The Bank of America funding lets Olive Crest to expand its Project Independence program to include housing assistance through site apartments, specialized career training and educational assistance through tutoring and scholarships. Olive Crest’s Project Independence program was founded in 2013 to assist the nearly 20,000 youth transitioning out of foster care every year. HELP of Southern Nevada has been awarded the 2016 Nevada Women’s Philanthropy Impact Grant totaling $385,000. A portion of the grant will provide furniture, a security system and other essential equipment for the organization’s new Shannon West Homeless Youth Center, a facility under construction that will serve twice as many homeless youth in Southern Nevada once completed. HELP currently operates a 65-bed homeless youth center. The construction of the new center will allow HELP to serve double the number of Southern Nevada’s at-risk youth, providing them with food, shelter, clothing, mental health and substance abuse counseling, essential life skills development, educational and vocational training. For more information on HELP of Southern Nevada, visit helpsonv.org. The Links Inc., an international women’s volunteer service organization committed to enriching, sustaining and ensuring the cultural and economic survival of African-Americans and other people of African ancestry, will bring more than 3,500 members to Las Vegas June 29 to July 3 at Mandalay Bay. And before they get down to their business, they’ll stage “A Summer for Smiles,” an event for Las Vegas children featuring dental screenings and education. During the convention, the group will present its Founders Award to Marian Wright Edelman, founder and president of the Children’s Defense Fund; George Shirley, emeritus professor of voice at the University of Michigan; John L. Burris, civil rights attorney at law; Ambassador Ruth A. Davis, retired; and Dr. Carl N. Williams, Jr., the first African-American hand and plastic surgeon in Las Vegas. PT’s Entertainment Group hosted Kegs for KMA, a fundraiser to benefit Keep Memory Alive, in support of the Cleveland Clinic Lou Ruvo Center for Brain Health. In all, $9,000 was raised from proceeds of all PT’s Brewing Co. draft beer sold at all PT’s Gold, Sierra Gold and Sean Patrick’s locations in Southern Nevada, in addition to an evening fundraiser at its Sierra Gold location. City National announced it has provided Financial Guidance Center with a $10,000 donation for program support. The money will be used for financial counseling and education programs to help individuals control their finances and reach their housing goals. Since 1972, Financial Guidance Center has served families facing financial stress from job loss, illness and accidents. The Foundation Assisting Seniors, a local nonprofit group, donated 10 wheelchairs to Honor Flight Southern Nevada to transport World War II veterans during their trip to visit war memorials in Washington, D.C. The foundation travels with 50 veterans each year. City National has provided Three Square Food Bank with a $5,000 donation as part of this year’s Bag Childhood Hunger Program. This donation is being matched by the Bennett Family Foundation, which will provide 40,000 meals to families and children in Southern Nevada who are food insecure and hungry. City National’s donation was also part of a volunteer night where its colleagues helped fill bags of food for the BackPack for Kids Program. Johnson Advisors visited Walter V. Long Elementary school on May 25 to announce the winner of the firm’s annual Fourth of July art contest during the school’s year-end assembly. The business consulting and CPA firm supports the youth in our community by partnering with an under-served elementary school in Clark Country to participate in its annual Fourth of July Card Program. The winning artwork will grace the front cover of the firm’s Fourth of July card that is sent to clients, friends of the firm, and other members of the community. Third-, fourth- and fifth-graders at Long Elementary were asked to portray why America is a great country to live in and what being an American means to them. Hundreds of entries were submitted, but it was the artwork submitted by fourth grader Sheila Salazar Magana who captured this year’s theme, Heart of America. Magana received basket of art supplies, and a $5,000 contribution was made to the school’s general fund. Brownstein Hyatt Farber Schreck helped host a carnival for its adopted school, Hewetson Elementary on May 19. The carnival was part of a Safe Summer Nights program for students and families of Hewetson. The Brownstein Karma Volunteers donated prizes and helped staff a variety of carnival games, including bobbing for apples, a beanbag toss and tic-tac-toe hula hoop. Citizenship Initiative LLC and the City of North Las Vegas hosted its inaugural A Salute to Veterans fundraiser June 18 at Cashman Center. The event was a benefit for local veterans organizations. For inquiries about this event, email citizenshipinitiativellc@gmail.com. Mike Mixer, executive managing director of Colliers International–Las Vegas announced that the company’s 22nd annual Links for Life Charity Golf Tournament raised more than $80,000 for various children’s charities in Southern Nevada. Its local office donated $25,000 to support Links for Life’s charitable efforts in Las Vegas. The tournament was held May 5 at Anthem Country Club, with benefactors from across Southern Nevada helping to raise money for numerous children’s charities. More than 100 golfers hit the links June 3 for 18 holes at Bear’s Best Las Vegas at the inaugural Rock the Socks Golf Classic 2016, raising $30,000 in support of Ronald McDonald House Charities of Greater Las Vegas and the families they serve. All proceeds from the event will benefit Ronald McDonald House Charities, which temporarily houses families who travel to Las Vegas to receive critical medical treatment for their children. The organization also supports programs that directly benefit children and families through scholarships, community outreach projects, and the recently opened Ronald McDonald Family Room at Sunrise Children’s Hospital. For more information, visit rmhlv.org.